Though emperumAn is ready to forgive the mistakes of everyone and protect them all, if he is not willing to forgive parAnkusa nAyaki (who is special unlike anyone else) and mix with her and thereby not wanting to manifest his kAruNyam (compassion), etc., what can we tell him? If emperumAn feels “If I mix with persons who are with offenses my reputation/greatness will be minimized – even if my nArAyaNathvam (being the protector of every one) becomes questionable, that is fine” – parAnkusa nAyaki requests a beetle (bumble bee) to go “I will suggest an idea that will not cause any damage to his reputation – you ask him to do like that” . Subsequently, parAnkusa nAyaki tells a beautiful radiant beetle (bumble bee) “Give a message to sarvEsvaran who has beautiful chakram in his hand”. Previously, parAnkusa nAyaki said “Even if you don’t want to eliminate our sufferings in separation, at least ensure that your nArAyaNathvam is not challenged”. For that, emperumAn replied “Even if my nArAyaNathvam is challenged, I do not want to be accused of mixing with unqualified persons”. Understanding this, parAnkusa nAyaki requests a beetle “There is a way where he does not get accused of mixing with unqualified persons yet ensuring we sustain ourselves; He can take a stroll for a sport or to protect an elephant (gajEndhran), etc; At such times, if he passes through our streets, that will not hurt his reputation. We would also sustain ourselves by seeing him through the window. Since this is possible, ask him to do that”. vari vaNdE – Oh bettle that has lines in our body! en pizhaiththOm – what mistake was committed? Oh circle shaped beetle who has lines on your body! When you go and see the master who has sudharsana chakram (who is even more merciful than emperumAn himself) in his hand, please tell him “Oh you who have vowed not to show your compassion on parAnkusa nAyaki since she has committed many sins/mistakes! you break your vow and show your compassion once by taking a stroll on the street where she lives on garudAzhwAr (who is an ocean of mercy) at least one day – before she loses her existence”. If he refuses to do so, she would wonder “What mistake did we commit that he does not even pass by our street?”. aruLAtha nIr – Just like you once vowed as srI rAma in srI rAmAyaNam sundhara kANdam 29.10 “…Ethath vratham mama” (this is my vow to protect those who surrender unto me), now you have vowed to not shower your mercy upon me. We (nampiLLai) cannot understand the current state of AzhwAr who once said “mayarvaRa mathinalam aruLinan” (he blessed me with unblemished knowledge) is now saying “aruLAtha nIr” (you who is not blessing me). Here, parAnkusa nAyaki is giving a name/title “aruLAtha nIr“. aruLi – blessing me – Compassion is your intrinsic nature. parAnkusa nAyaki’s state is so pitiable that even the most unkind person would feel compassion for her. So, why are you not blessing her? 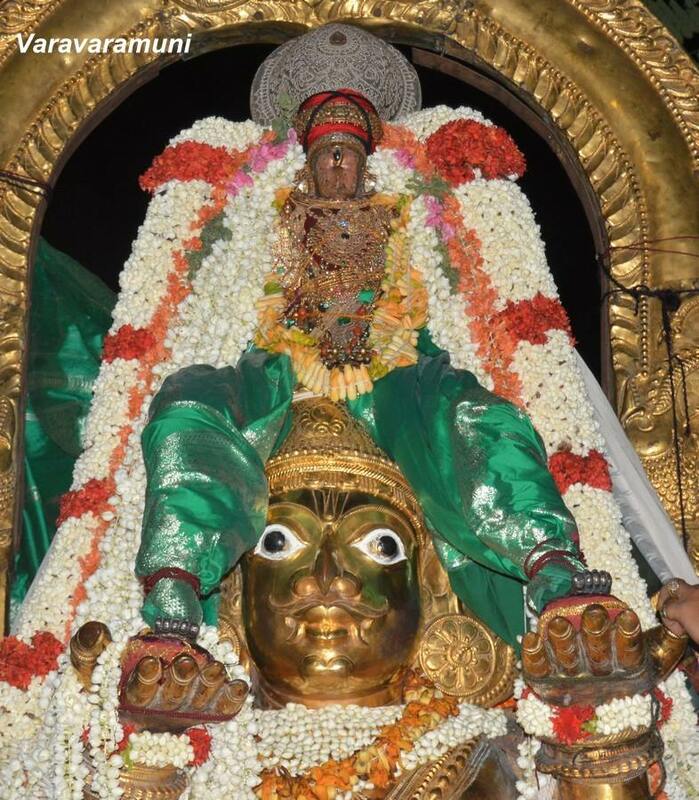 avarAvi thuvarAmun – Bless parAnkusa nAyaki before she loses her existence. Just like sIthA pirAtti requested hanumAn to inform srI rAma about her state in srI rAmAyaNam sundhara kANdam 39.10 “jIvanthIm mAm yathA rAmassambAvayathi kIrthimAn…” (by conveying the message using the appropriate words to the illustrious srI rAma, so that he can console me while I am surviving, you become virtuous through speech), here parAnkusa nAyaki is requesting the beetle and the beetle is informing the message to emperumAn. aruLAzhip puL – garudAzhwAr who is an ocean of mercy; Before when garuda carried emperumAn away from her, she said “vem chiRaip puL” (garuda with cruel wings); now that garuda will bring emperumAn to him, she says “aruLAzhip puL“. kadavIr – “kadaththal” in thamizh is used to indicate driving a vehicle, etc (which is achEthanam – without knowledge) with the effort of the driver. But here, though garuda is chEthanam (knowledgable), he may sometimes be little bit lethargic/slow (wanting to enjoy emperumAn who has a tender body being seated on him) and emperumAn wanting to help his devotees quickly, he drives garuda by poking him, etc., to increase garuda’s speed. avar vIdhi – Where should he take a stroll on garuda? In the street where parAnkusa nAyaki lives. Would it not be suspicious if a person regularly strolls in a street where a girl lives? orunAL – To help us sustain ourselves, he Just needs to visit for one day. aruLAzhi ammAnai – Multiple explanations given by nampiLLai. Our master who is ocean of mercy as stated in periyAzhwAr thirumozhi 4.9.2 “thAmaraiyALAgilum sithaguraikkumEl ennadiyAr athu seyyAr” (Even if srI mahAlakshmi herself finds fault in his devotees, he would say “My devotees would not do anything wrong”). His mercy is even greater than the mercy of periya thiruvadi (garudAzhwAr). Considering “aruL” (compassion) as adjective for “Azhi” (sudharsana chakram) – our master who has the most merciful sudharsana chakram in his hands. He is already glorified by nammAzhwAr in thiruviruththam 33 “aruLAr thiruchchakkaram” (sudharsana chakram who has abundance of mercy). emperumAn himself borrows his mercy from sudharsana chakram. Even if emperumAn refuses to show mercy, his sudharsana chakram will show mercy towards the devotees. ithu solli aruL – you tell “aruLAzhip puL kadavIr avar vIdhi orunAL” to him. Azhi varivaNdE – beautiful beetle which eliminates our fatigue on seeing it. It can also be said as though the beetle is small, it is most generous/helpful – willing to fulfill the desire of parAnkusa nAyaki. This indicates that both the form and qualities of gataka (AchArya) are to be cherished. yAmum en pizhaiththOmE – What mistake did I commit? “yAmum” (us also – um in the end indicates “also”) – Just like you let us suffer after separating from us, did we also wait for you to come at your pace? While you are the one who surrendered to an animal (sugrIva) and sent an animal (hanumAn) as messenger – now we have reversed that role (surrendering to crane, beetle, etc., and sending them as messenger). Even after this, you not coming here – is it your fault or ours? This entry was posted in thiruvAimozhi, thiruvAimozhi 1st centum on July 22, 2015 by Sarathy Thothathri.